Hey everyone !!! Hope you all had a very Merry Christmas !! I had a lot of fun with a lot of gifts and food with friends! It was a super warm happy weekend for us! So along with other gifts I made this DIY for my friends. I know it’s coming a bit late for you guys but I really wanted to share it with you guys and do give it a try for New Years or any other occasion. It’s the perfect gift accompaniment ! Let’s start with getting the stuff we need for this. Mason jars , I wanted clear jars but was only able to get these tinted ones. I recommend getting clear though. Hot chocolate mix – I used Swiss Miss dark chocolate mix. You can use cocoa powder too but you will have to add sugar along with it according to taste and it might be a little hard to get it right as we are just dealing with the raw ingredients here. That’s why I used this hot chocolate mix as it already has the right amount of sugar in it. Next up is creamer or powdered milk. Since the hot chocolate mix requires it to be made with milk I added this coffee creamer. You can use any kind of powdered milk or creamer. You can even use flavored ones like hazelnut would taste great! I added dark chocolate chips next. I used these ones by Ghiradelli. These chips are really creamy. Make sure to get real chocolate chips and not just artificial flavored chocolate flakes and all that. As we need them to melt in the mix and be real creamy. I topped this with mini marshmallows. You can add as many or as less as you want of this. You can also top up with candy cane bits or toffee bits to add different flavors. I stayed with simple classic hot chocolate ! Talking about the proportions , I used 1.5 packet of the hot chocolate mix in each jar. I added the creamer next and mostly just estimated the quantity for it. Now since this has creamer , we only need to add water to dissolve it all in. I have also tried with milk and it gets rich and creamier and totally works but I felt it was too thick for my liking but it depends on your taste ! 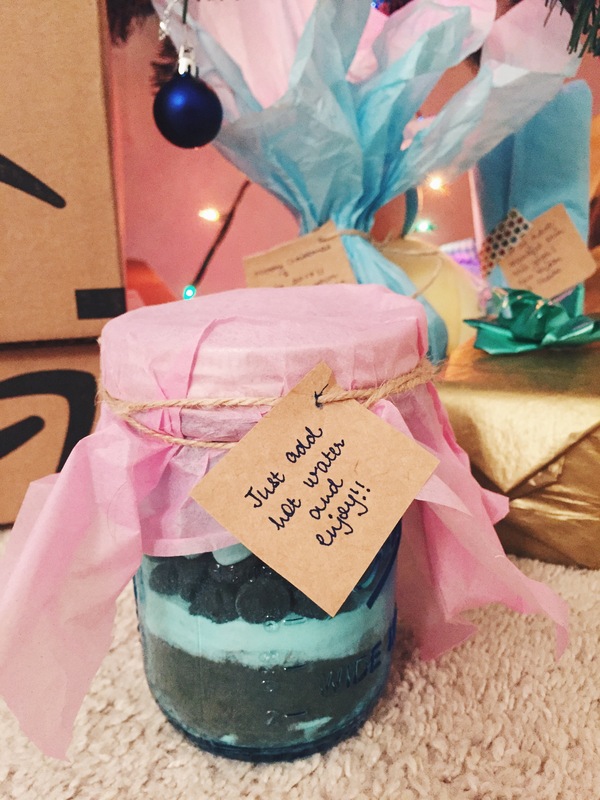 I packed the jar with some tissue and a little note on some kraft paper! It was a great gift and it tastes so so so yummy , I hope you guys try it and Tweet me to let me know how you like it or tag me in your Instagram pictures!